We offer business growth consulting on the topics of corporate growth, growth crises, growth hurdles and help companies that experience rapid early growth, but then suddenly realize that they can’t sustain it. Employees are constantly burdened by more work, the working atmosphere deteriorates, customers are dissatisfied, and conflicts occur on a daily basis. We help you to align your company for healthy, sustainable growth. This involves bundling the energies of employees, adapting structures, optimizing processes, deploying the right employees and managers in the right place, and creating new functions that take account of your company’s size and growth aspirations. In addition, we work with you to create a conducive atmosphere, set up a good communication and information policy, and establish a modern management culture. We would be happy to discuss this with you. 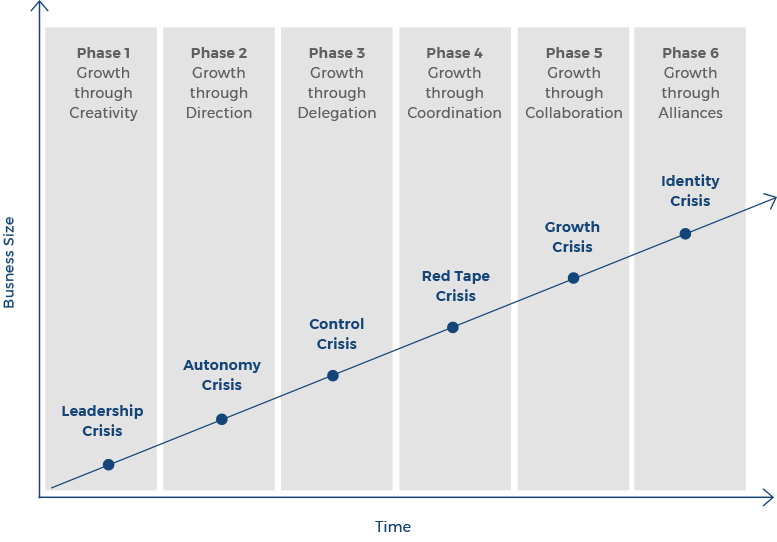 According to the economist Prof. Larry E. Greiner’s growth model, companies go through six growth phases depending on their age and size, each of which begins with growth and ends with a crisis. The transition to the next phase is called a growth crisis. The so-called GREINER curve enables companies to identify their current growth phase, identify problems in the growth process at an early stage and counteract them with prepared solutions. We will gladly guide you through your growth crisis. Our growth consultancy shows companies how to successfully overcome their respective growth crises through change management. As fast-growing companies often lack experienced managers, the first step should be to establish a common understanding of professional leadership, e. g. in the form of a mission statement. This also includes encouraging all managers to commit themselves to creating an innovative, motivating culture within their team. Structures must be implemented that are appropriate to the respective size of the company and allow for growth. It is also important to establish meaningful processes and tools. In order to cope with the constantly growing volume of work, an efficient recruitment process and the rapid training of new employees are required. If there is a need to make larger investments, a financing model should also be developed instead of postponing investment for misguided reasons of economy. In order to coordinate the entire change process, the company needs to appoint a change manager. If companies can then succeed in establishing an innovative corporate culture, they are on the right track. You can talk to us about all this and more at any time.